Irish Open victim Robert Rock has no hard feelings over his sudden-death defeat to Shane Lowry. The English ace heard cheers from the partisan Irish crowd at Baltray when he missed putts in the play-off to claim the title or stay alive. But he plans to congratulate Lowry at this week’s European Open after failing to get the chance to do it properly in the 18th green hysteria. Rock said: “There were only two people walking around who wanted me to do well and the majority were for him, but that’s fine. I’d be daft to expect anything else. Rock was highly impressed with the way Lowry, 22, performed under massive pressure and backed his decision to turn pro this week. He said: “I feel I could do it now but at 22 and in your first event as well, in your home country, that’s very impressive. Rock has yet to win as a pro but has three second places to his credit this season alone and racked up €786,300, including €500,000 in Ireland. Shane Lowry smiled his way to a super 65 to keep his 3 Irish Open title defence alive. Rock admits Lowry-saurus is "tougher than Tiger"
Robert Rock will never forget the Irish crowd that cheered Shane Lowry to victory at Baltray. 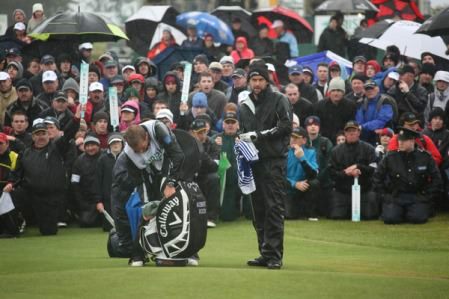 “That was really, really tough.” Photo: Fran Caffrey/www.golffile.ie..Home hero Shane Lowry insisted he fears no-one after a sensational birdie-birdie finish left him on collision course with old enemy Robert Rock in the Irish Open.